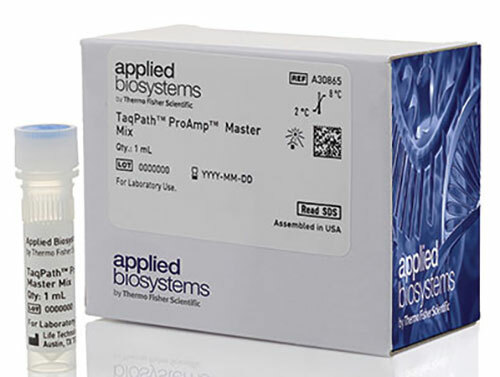 The TaqPath™ ProAmp™ Master Mixes are versatile solutions developed for high-throughput genotyping and copy number variation (CNV) protocols requiring accurate results from samples containing PCR inhibitors. TaqPath ProAmp Master Mixes are designed to deliver sensitive and reproducible results from genomic DNA targets. Two formulations of multiplex assay-compatible master mix are available: TaqPath ProAmp Multiplex Master Mix with Mustang Purple for multiplexing up to four targets; and TaqPath ProAmp Master Mix, which includes ROX™ as the passive reference dye. Both mixes enable measurement of FAM™, VIC™, and ABY™ dye or other dyes with similar emission wavelengths. The multiplex version also allows the use of JUN™ dye, or other dyes with similar emission wavelengths. These two formulations are manufactured in an ISO 13485 certified facility to help ensure manufacturing consistency.